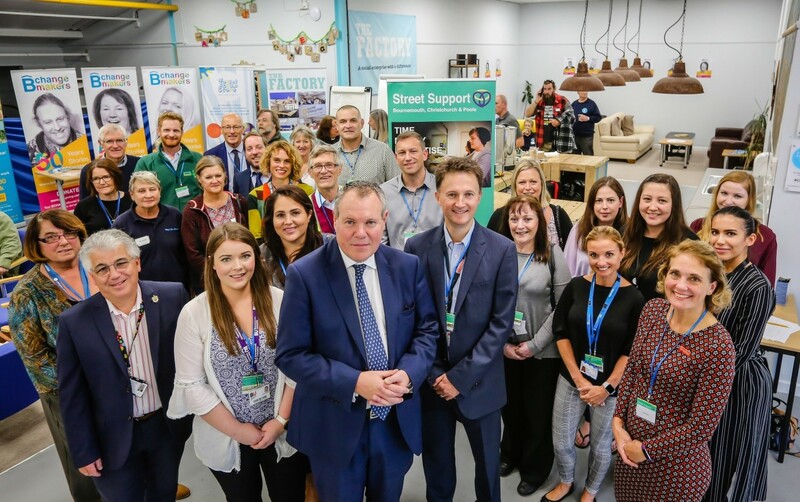 Street Support Bournemouth, Christchurch and Poole, hosted their relaunch event at our multi-use premises, The Factory. This exciting multi-agency initiative aims to reduce homelessness in Bournemouth, Poole and Christchurch with the help of 30 local organisations including BCHA. Crisis’s homeless monitoring report (2018) highlights a concerning increase of 169% in homelessness across the UK from 2009-2017. This figure brings into focus the housing crisis we’re currently faced with, which could be addressed by more collaborative approaches, like Street Support. Street Support enables a network of organisations, voluntary groups and local authorities to work together to reduce homelessness in the local area. BCHA; Boscombe Angels; Bournemouth and Poole Rough Sleepers Team (St Mungos); Bournemouth Christians Alongside Rough Sleepers; Bournemouth Foodbank; Bournemouth Borough Council; Christchurch Community Partnership; Citizens Advice Bournemouth and Poole; Dorset Healthcare (NHS); Dorset Community Foundation; Hope AOK Rucksack Appeal; Faithworks Wessex; Half Time; Hope For Food; Hope Housing; International Care Network; Michael House; Poole Borough Council; Poole Waste Not Want Not; Providence Surgery; Routes To Roots; Second Chance; Shelter; Teen Challenge Dorset; The Big Issue; The Salvation Army BH1 Project and YMCA. The website brings all of these organisations onto one platform making it a one-stop online resource for its audience. As a result, this improves access to all the services available for homeless people locally. Homelessness is a growing issue nationally and locally. In order to make an impact Street Support Bournemouth, Christchurch and Poole looks to expand further. Therefore, the network is seeking more businesses to get involved as well as a sponsor, to help with current running costs and to facilitate growth. To get involved or for more information check out the Bournemouth Street Support website. More specifically, to get an insight into how BCHA are individually tackling the housing crisis locally have a look at our Bchangemakers website, where we are highlighting 50 stories about “changemakers” during our 50th year to celebrate the fantastic work of our people and partners.